Days after Hurricane Florence slammed into land with nearly 3 feet of rain, residents continue to evacuate rising waters amid a sprawling disaster that's beginning to feel like it will never end. 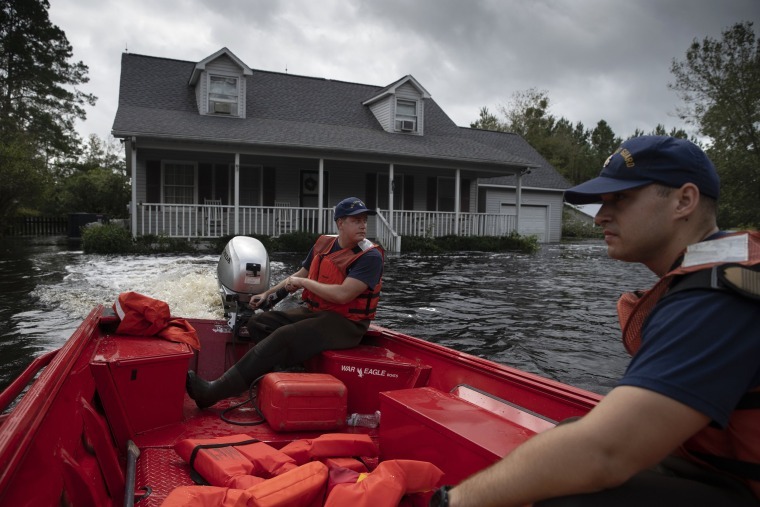 Coast Guardsmen Gavin Kershaw and Javier Carrsquillo check for residents stranded due to flooding in Columbus County, North Carolina, on Sept. 17. This corner of hurricane-ravaged North Carolina is so isolated the that locals say there's just "one way in and one way out." Now, in the wake of Florence, the only way out for many on Monday was by boat — or with the help of the National and Coast Guards. 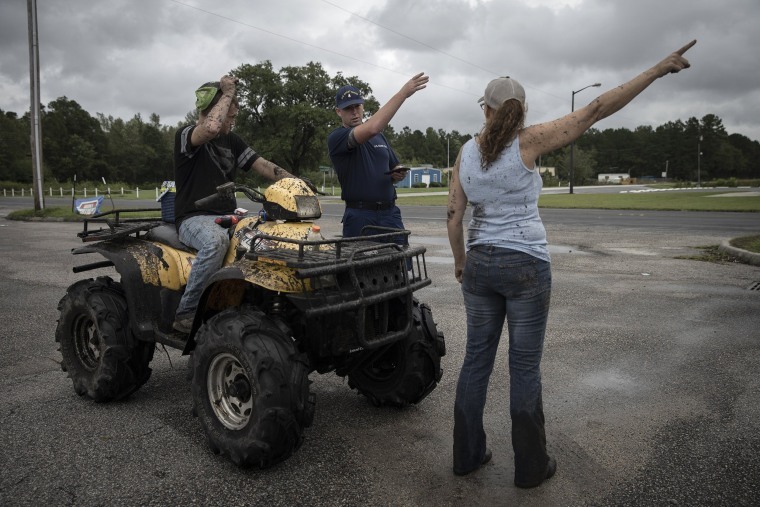 Across North Carolina, officials reported more than 1,000 water rescues as the rain continued to fall and swollen rivers continued to rise. Coast Guard Guard Chief Steve Kelly speaks with people in Columbus County. 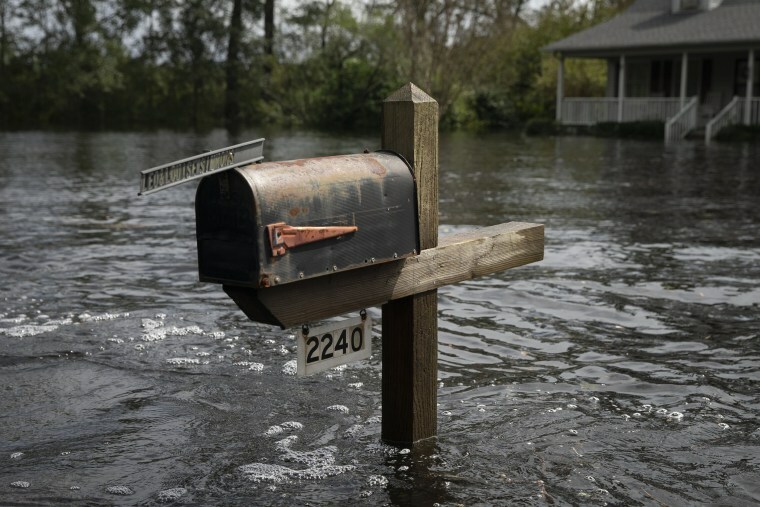 A half submerged mailbox in Columbus County. 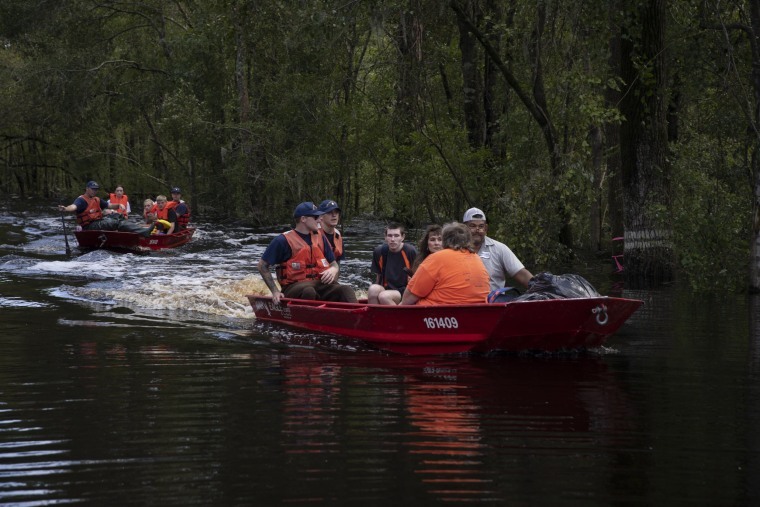 Members of the Coast Guard evacuate residents of Crusoe Island, bringing them to dry land in Columbus County. 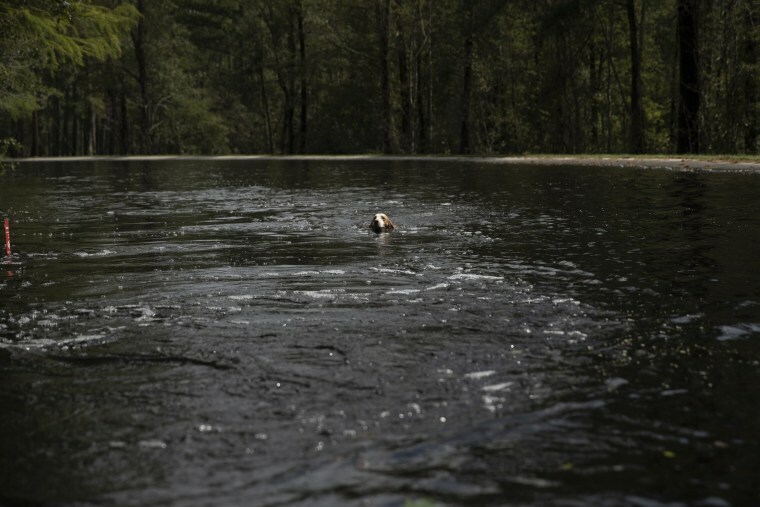 A dog left in its home swims up to a Coast Guard rescue boat in Columbus County. 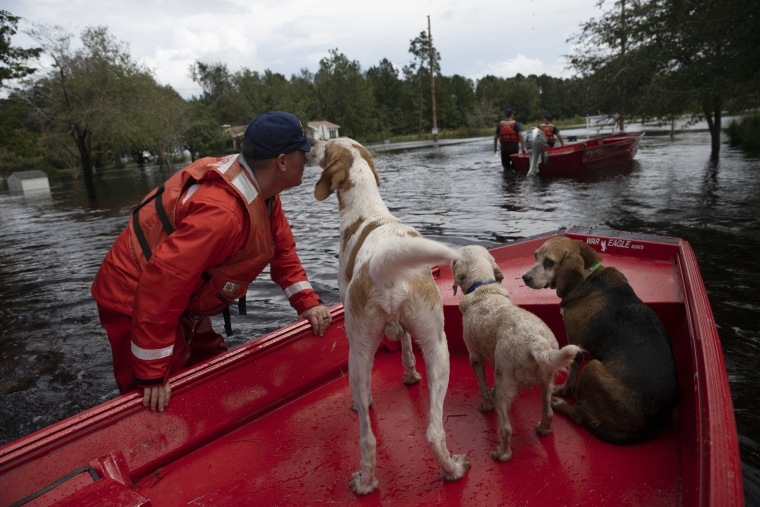 Coast Guardsman Taylor Elliot rescues dogs left in their homes in flooded areas of Columbus County. A flooded house in Lumberton. 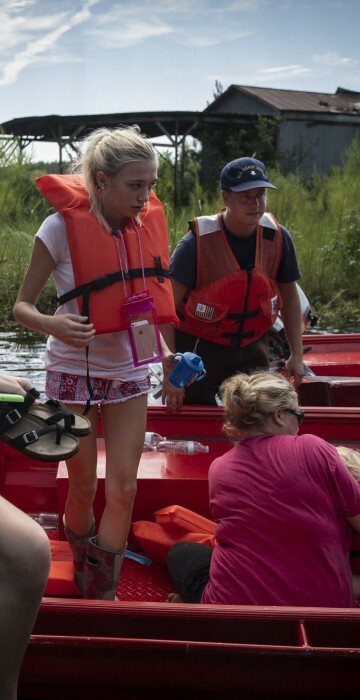 Residents of Crusoe Island are brought to dry land in Columbus County. A sleeping child is carried after residents were evacuated from Crusoe Island. 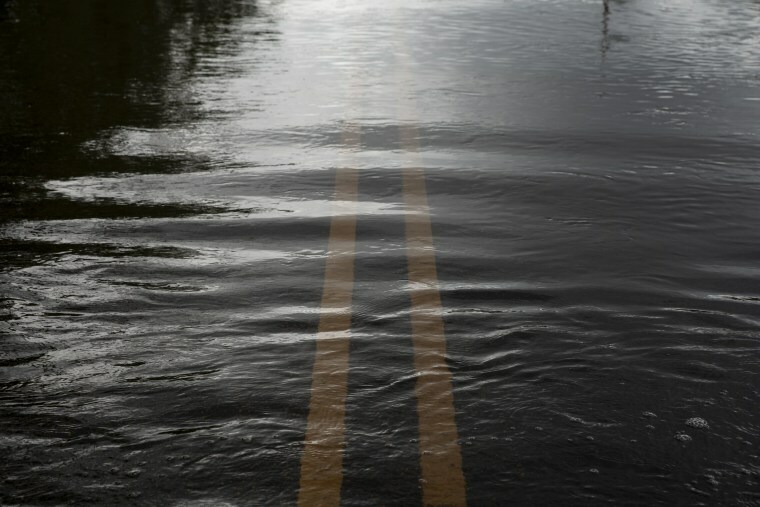 A flooded road in Columbus County. 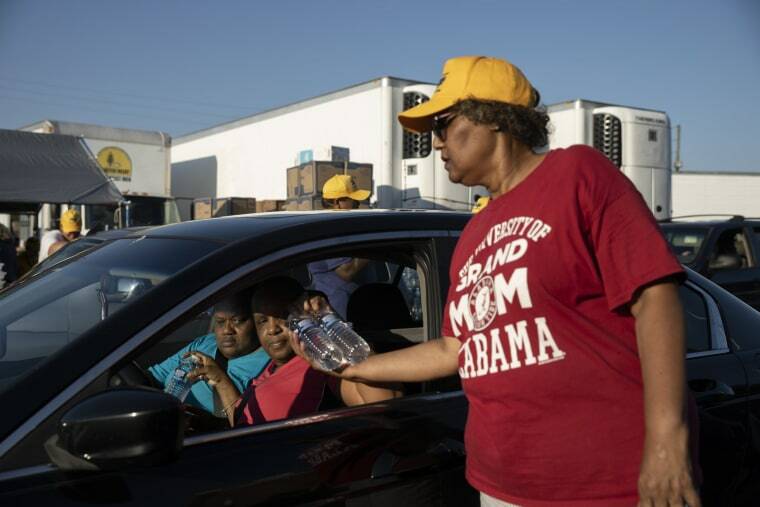 Volunteers with Baptists on Mission hand out water bottles to those affected and displaced by the recent flooding in Lumberton on Sept. 19. The church group has nine mobile sites throughout the state. 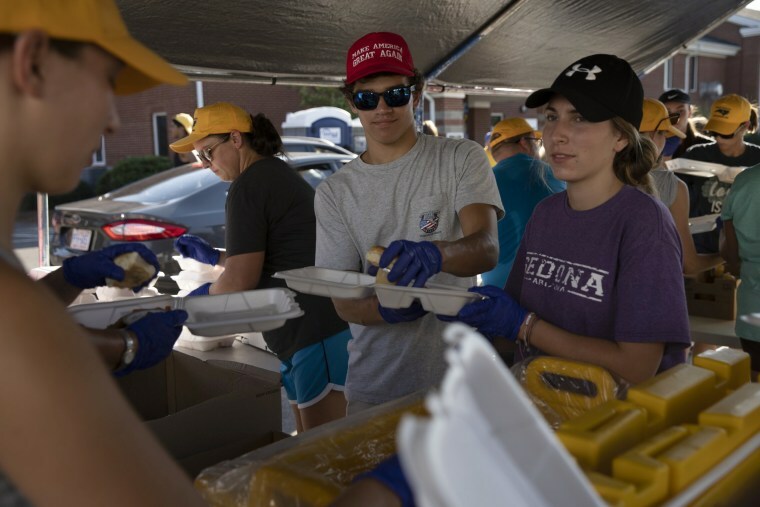 At the Lumberton location, 125 volunteers handed out 20,000 dinners that included a chicken patty on a roll, a container of applesauce and handful of baby carrots. Volunteers prepare food for those affected by the flooding in Lumberton. 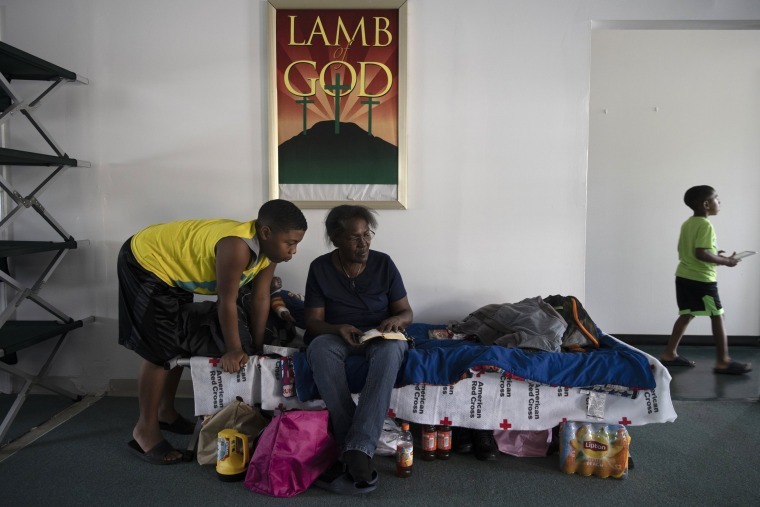 Najaeh Alford, 11, left, reads the bible with Linda, a fellow displaced person, at the Divine Refuge Ministries church in Lumberton on Sept. 18. 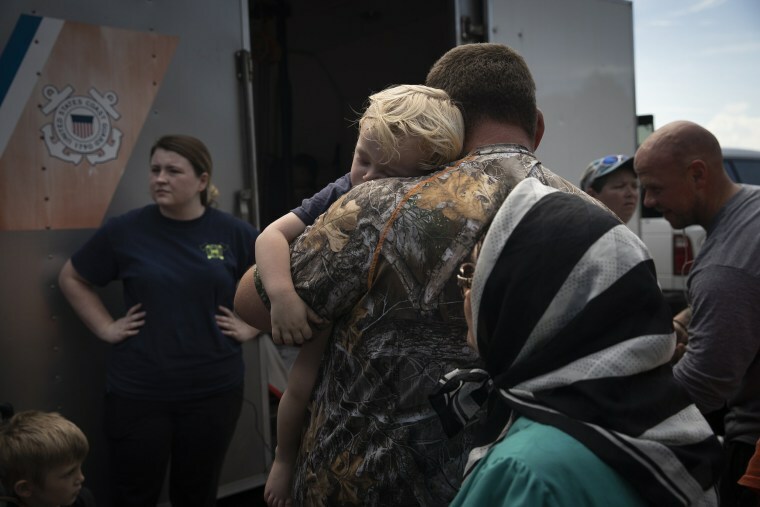 Many have taken refuge in churches, relatives homes, and shelters, once again being the victims of flooding after a hurricane. 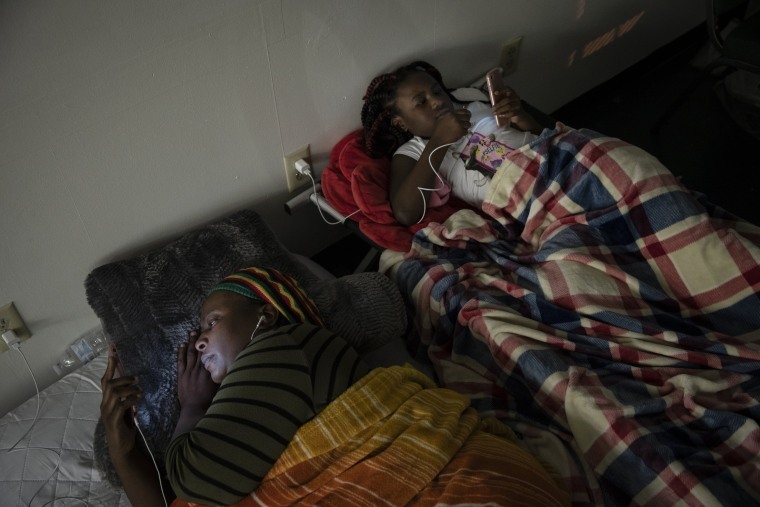 Shekila Dupris and her daughter Nia rest in a church shelter after being forced out of her home in the south of the city due to flooding in Lumberton. This is the second time they have been forced out of their home. They were only just able to return after Hurricane Matthew in January. Less then a year later, they have been forced out again. Shekila is worried about the impact it will have on her three children. Schools have been closed indefinitely due to the floods. 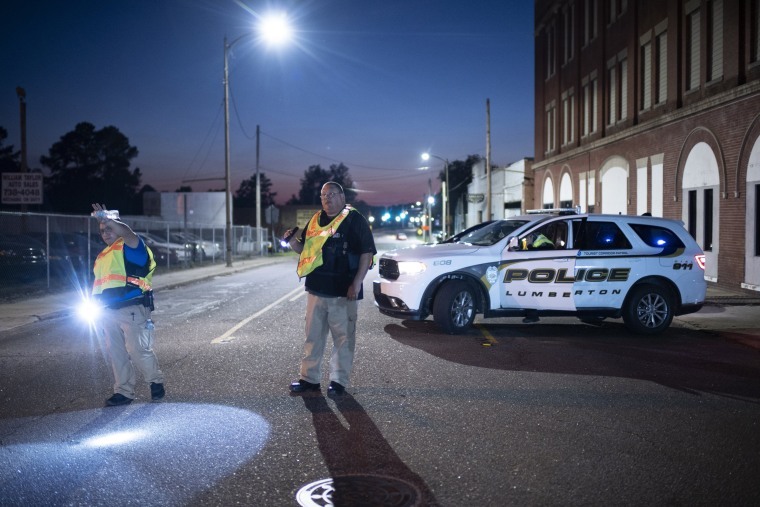 Police divert traffic away from flooded areas near downtown Lumberton. The remnants of a portion of a temporary berm in Lumberton that was built to mitigate flooding from the Lumber river. 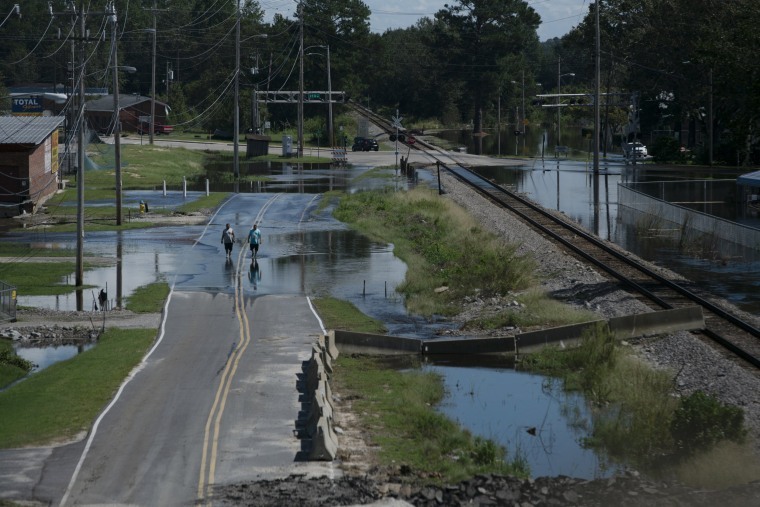 CSX delayed the building of the berm until Sept. 15, forcing locals and the National Guard to work amid rain and tropical storm force winds. 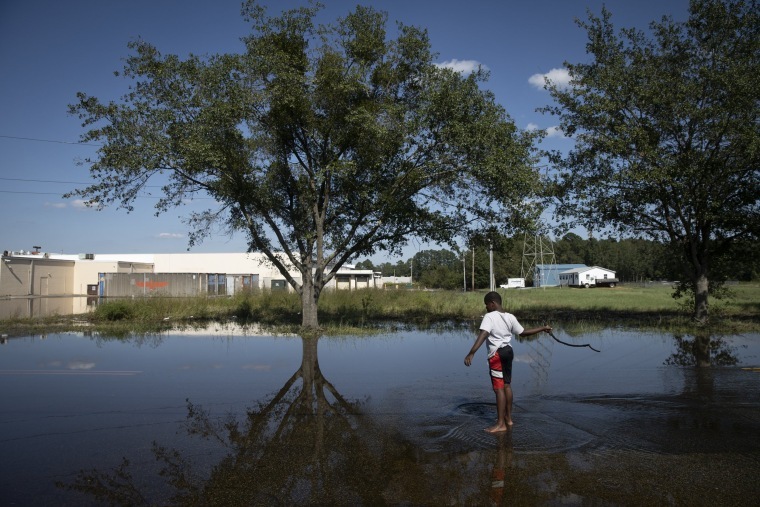 Xavier Hamilton plays in floodwater in Lumberton on Sept. 20. 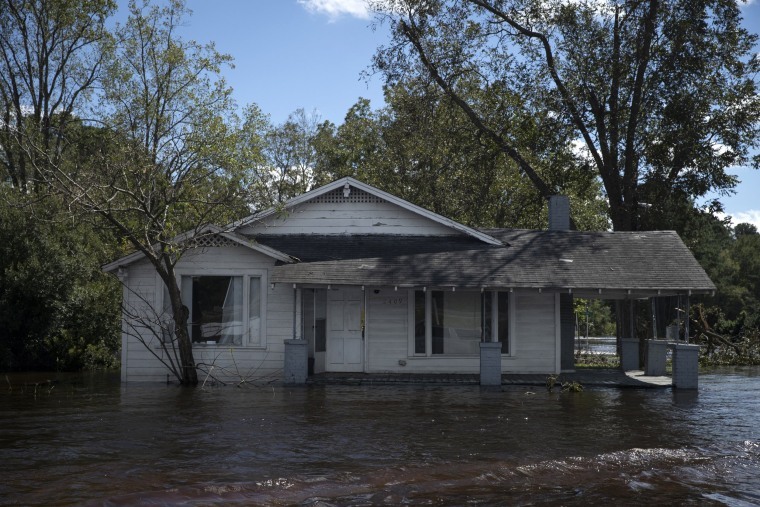 After Hurricane Florence brought heavy rains and storm surges that flooded the Lumber River on Thursday, his town once again disappeared under feet of brown murky water only two years after Hurricane Matthew did almost the same exact thing. 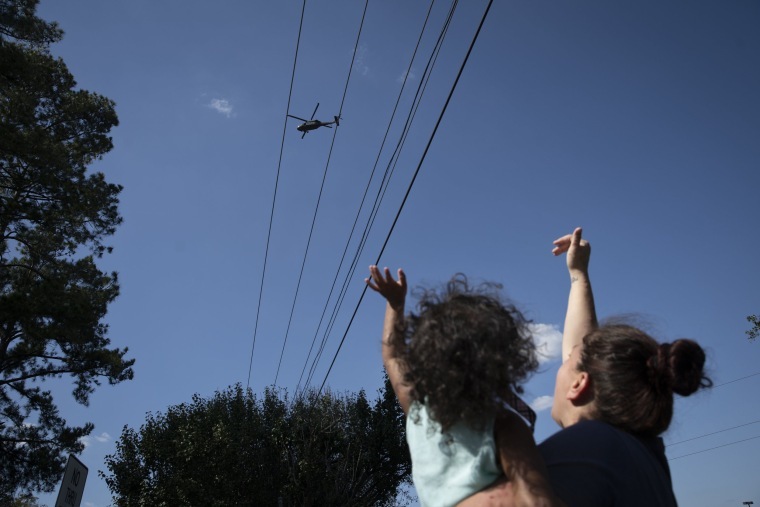 Gloria Orozco-Freeman and her daughter Isobella wave to an approaching helicopter in front of their home in Lumberton.